In my previous xAPI article I pointed to the emergence of "geek-free tools and platforms" as the hallmark that xAPI is beginning to achieve main-stream status. This isn't the dumbing-down of the specification or possibilities it holds for the industry so much as it is the provision of accessible, entry-level ways to take advantage of xAPI as a stepping stone to providing deeper learning experiences across the whole enterprise. It's a progression of the industry toward more, toward faster, and toward better. In the 1960s, Dr. Bruce Tuckman proposed a team development model that lends some structure to the conversation about xAPI. The thinking is that a team goes through more or less orderly stages of Forming > Storming > Norming > Performing as they become a cohesive unit able to grow, face challenges, solve problems and deliver results. 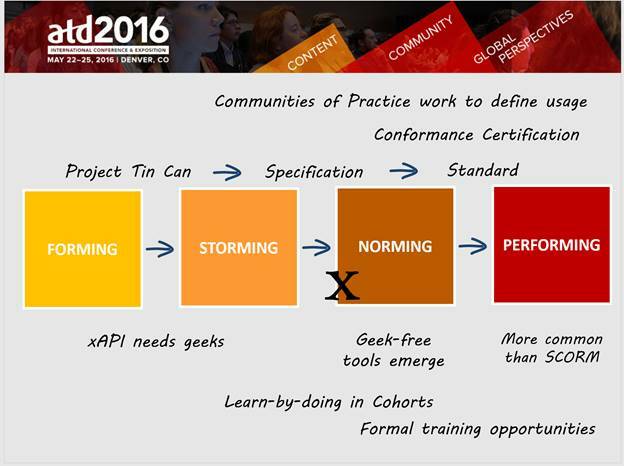 The L&D community, in particular the xAPI community, while not a team, is appearing to follow a similar pathway as we move into a post-SCORM reality. Here's a slide I presented at the 2016 ATD ICE conference in Denver. In the early Forming and Storming days of xAPI, there were no off-the-shelf tools that supported it. Just about every xAPI project getting press and conference time was a well-resourced, custom-built learner interface for a typically narrow topic area with custom-built data visualizations all in close connection with (it not developed by) the learning record store (LRS) provider. And I include TorranceLearning's own projects in this. Amazing things were happening, but there were a lot of geeks involved. The bar was set high. It wasn't the kind of thing that was within reach for many instructional designers, certainly not for those who needed a pilot project to prove their point about this new-fangled specification within their organizations. Four leading courseware development tools have adopted the specification, putting the creation of xAPI statements within reach of the average elearning instructional designer/developer. Adobe Captivate, the DominKnow suite, Lectora, and Articulate Storyline all offer publishing capability for xAPI. They each provide a basic level of page and interaction tracking via xAPI, with DominKnow and Lectora offering even more flexibility around the creation of activity statements. LMSs are integrating LRS capabilities alongside their SCORM engines, making it easy for organizations to adopt xAPI without an additional capital outlay or the disruption of switching learning platforms. The leading LRS-alone platforms are moving ahead full steam (Wax LRS, Watershed, Learning Locker, and Grassblade), allowing organizations to assemble a best-of-breed learning experience that all reports back to a single data source. Now LMS providers are adding integrated xAPI capability as well, alongside their existing SCORM and AICC support. Whereas a software selection process in 2015 for an integrated LMS/LRS was limited to a very short list of progressive providers (LearnShare, RISC, OnPoint Digital), the bigger players are working on their xAPI capability right now. 2017 will show a far different landscape. 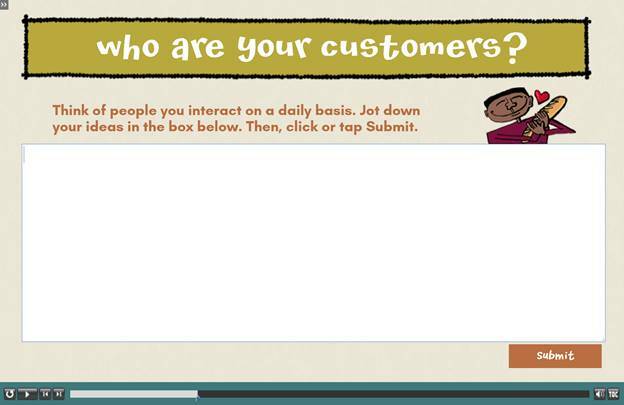 Real world example: Why do you care about integrating LRS and LMS functionality? Because many organizations rely on the course catalog, enrollment, search and reporting functions their LMSes offer. When we have access to and collection of more and more data, reporting becomes the secret weapon, the killer app, the super power that the L&D team needs to wield next. At the Ann Arbor Hands-On Museum, iBeacons identify student visitors to the iPads placed next to key exhibits. Throughout the students' interactions with the exhibit, the app on the iPad uses xAPI statements to capture data about their interactions, their responses, the time spent on each activity, and the curriculum standard related to the exhibit's science topic. This program uses the LRS embedded within the Museum's LearnShare LMS and leverages its geek-free custom report wizard to query and display details about the interactions. Museum staff have access to use their data without having to ask their vendors for reporting assistance. Why the focus on elearning tools and platforms that look like learning management systems when xAPI promises to let us all break free of that hardened infrastructure? Tool providers in the learning space that didn't traditionally support SCORM tend to be (generalization there) slower to adopt xAPI but they are coming around as they see the silo-busting capability here. Not a month goes by that I don't talk with another learning tool provider about getting on the xAPI bandwagon. These providers are heavily invested in their own dashboards and data, but a few are seeing the value to their customers in allowing their data to enter the shared learning ecosystem. Examples? xAPIApps offers a ready-to-go suite of coaching, observation, live training, and assessment tools. Train by Cell is developing their xAPI capability and demoed a basic set of statements at the xAPI Party and TorranceLearning Download in May. The xAPI space is a faster moving segment than the rest of the L&D industry. This article, while showing only a few narrow applications, should be outdated in a matter of months... and that's a good thing! Is it time to get on the bandwagon? If not now, it will be pretty soon. At this year's DevLearn conference in November and then TechKnowledge in January, a significant number of speakers and vendors will be talking about xAPI as the industry is getting ready to move. Letting every learning designer set vocab. as they choose isn't necessarily a good thing, maybe 2 learning designers in a company aren't using the same vocab. for a specific event, not to say all designers in the industry. Also they aren't dataviz designers, so only the most primitive chart with vocab. counts are available for them. Better way could be to import vocab. set according to recipes pre-designed. On the other hand, authoring tool might not handle the "context" data, they must allow designers to set context information such as parent, category etc.